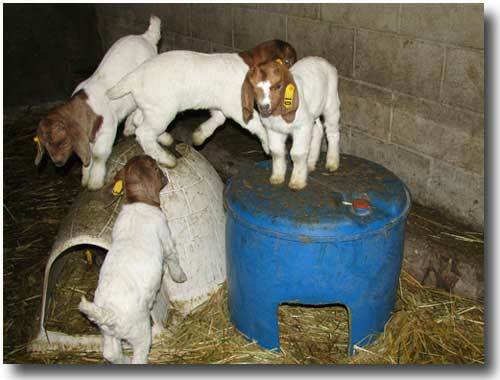 The kids below were born January/February 2013. Kids in 2009 - Trickman Style! 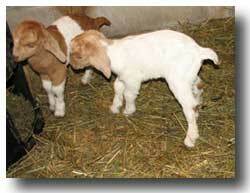 This set of twins - doeling and buckling- are just a sampling of Trickman 2009 kids. These two cuties are products of a young solid red doe we showed last Summer and BQB Legion a.k.a. Ben. This picture is the goat version of "Ring Around the Rosie" or maybe it is "Duck, Duck, Goose"...who knows but one thing for sure is the kids are having fun! These kids are between one and two weeks old. This is picture of a few more kids born in late February. We have a diverse bunch of kids -- lots of colors. 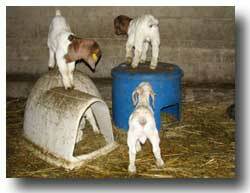 This is a picture of a few of the kids playing on their houses. These guys and gals are all between one and two weeks old... they are so much fun to watch as they jump from roof top to roof top playing "King or Queen of the Hill". Check out the front end on this fellow...he will be on the sale page in the near future. 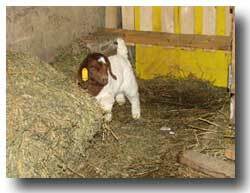 He is a high percentage boer buckling. Powell / Holman Doe X Loid Buck. This is a picture of a set of twins less than 24 hours old...they are both does. We think they are both beautiful but the paint is extra special in our eyes. Finally the kids can get out in their playpen and play...this is the first time they have been out and as you can see a few of them have been brave enough to come outside. Soon they will be running across their play structure...I think somebody already has by looking at the foot print in the snow! 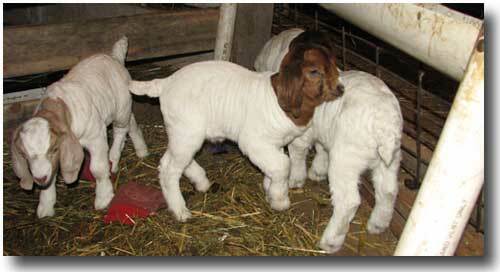 This is a picture of one of the bucklings born 2 weeks ago. 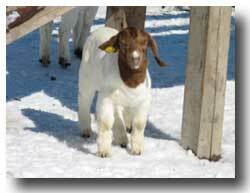 He is out of a doe whose grandsire is Bingo and sire is Powell/Holman 231P. He is a stout guy which will appear later on the sale page. This big boy's sire is LOID R3. 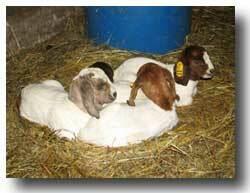 This is a picture of triplets at one week old. All three of these guys are bucks. We really like these three guys as they are stoutly built, both thier dam and sire originated from the Loid Farms in Kentucky. .